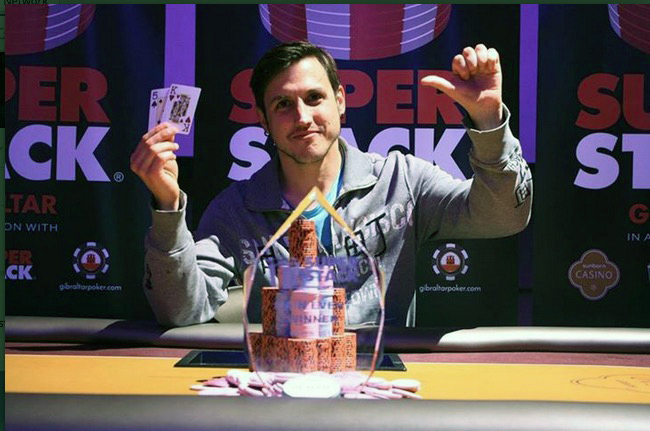 Congrats to Canadian Bruno Tynd who has taken down the Super Stack Gibraltar tournament after battling through 223 players for a the title and over £9,000, the lion's share of the £33,450 prize pool. Tynd hails from New Brunswick but is currently working as a teacher at the Do Mundo Lume language school in Ayamonte in Andalucia. 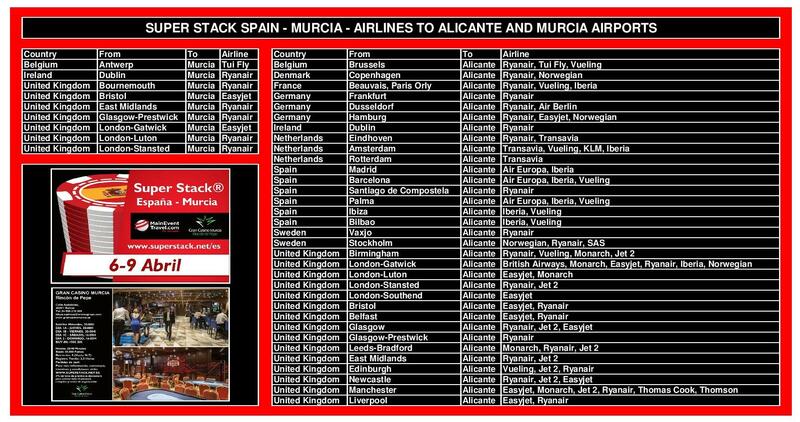 The next Super Stack Spain event is a brand new stop at Gran Casino Murcia running April 6-10. The historic and beautiful city of Murcia is close to Alicante which has numerous cheap flights from the UK. See below for graphic showing all the flights to/from countries all over Europe. Day 1a of the event starts 8pm on Thursday with Day 1b at 8pm on Friday, 1c on Saturday at 2.30pm and a 1d flight at 10.50pm. Following the fantastic Super Stack structure, players get a 30,000 stack with 30 minute blind levels. The final Day 2 is on Sunday. All Super Stack destinations are easy and cheap to get to. There are numerous return flights from the UK to Spanish resorts from well under £100 enabling Super Stack® players the chance to compete in great locations at an affordable cost. As MainEventTravel is Super Stack’s Official Travel partner, we can arrange fantastic hotel deals for all the events. Super Stack Gibraltar will be back in August and November and held on the amazing 5 star Sunborn Super Yacht Hotel, Resort and Casino and players can choose from a range of packages that include the £170 tournament buy-in. Among those who competed at last weekend’s event were former Gibraltar champions Marcel Schütt and Matias Bagalini. There are flights from the UK on Easyjet and Monarch from Gatwick, Luton, Manchester and Bristol. As well as Sunborn Super Yacht Hotels, MainEventTravel.com can also book accommodation at Hotels Campo De Gibraltar just across the border with twin rooms going from about £240/room for four nights, £180 for three nights and £120 for two nights. Further Super Stack Spain events are taking place at Casino Torrequebrada near Malaga in June, September, October and December plus the new Super Stack Costa Brava event from July 27-31 and Super Stack Castellon from November 2-5.